Supplied with an ‘air/vacuum’ pump. Plug into a three-phase power supply and switch on. Simply place a suitable pallet onto the steel skid plate for the material to land on. it will lower automatically sounding an alarm when it is 100mm from the floor. The skid plate can be lowered to the floor allowing the pile to be removed with a standard pallet truck. Pneumatic jogger blades are free to be positioned close to the corners, which achieves excellent sheet alignment. Auto Feeders sheet stackers are placed at the end of a machine line; where they will automatically pile the product onto a pallet. The stacker reacts to the incoming sheets making any complex linkage between the machines unnecessary. Built in eight standard widths, four lengths and fourteen heights. 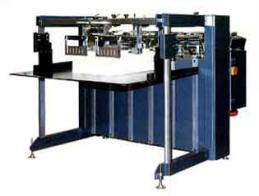 The largest machine will handle sheet sizes from A4 up to 1230 wide x 1450 long. Will stack at speeds up to 8,000 sheets per hour depending on material size and charteristics or 16,000 sheets per hour when shingled. 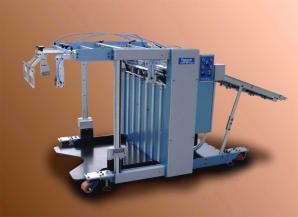 This mobile sheet stacker can be wheeled in placed at the end of any line. A useful addition to any company involved in printing or processing sheets of: card, board, paper, plastics, etc. It can be conveniently moved from one production line to another as the requirement changes. Screw down feet will hold the stacker in position and level it on uneven floors.